Learning to tell the time can be really fun and interactive. Check out this collection of ideas that can be used with groups of children in the classroom or with your child at home. There’s a number of ways these activities can be adapted to increase challenge and extend your children’s understanding of how to tell the time. 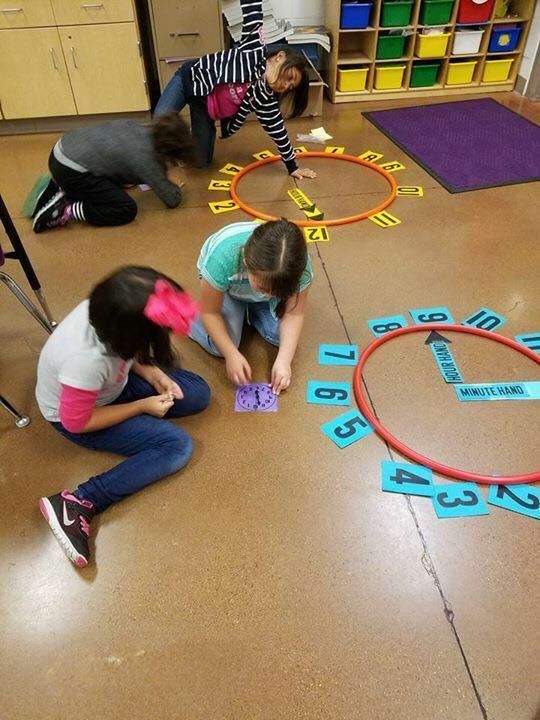 I love this idea from Tunstalls Teaching Tidbits using a hoola hoop and number cards arranged around it to model a clock. Children are then asked to arrange the hand cards to represent time. This is another great alternative from Mr First Grade using a hoola hoop attached to the classroom board. Children can use a dry erase marker to draw the hands of the clock to represent different times. This is a fantastic interactive approach to a time telling lesson from Techie Teacher Time. I love how the children are using their bodies to model the hands of the clock. If you have a round table in the classroom or a round coffee table at home, this giant table clock idea from aplusfirsties is a great interactive time telling activity. This matching activity from THE STEM LABORATORY makes all of that hard work fun for kids — and it’s a wonderful way to recycle your plastic Easter eggs too. Make a playdough mat clock like this one from MISS GIRAFFES CLASS who also has a few more neat ideas up her sleeve too. This is one we did ourselves. It’s a huge hit and you’ll see how we’re planning on extending it here on our ROCK CLOCK story. Counting to 60: Children need to be able to count to 60 before they can tell time. Help them learn by having them read the numbers from a chart, write them, and recite them from memory. Counting by Fives: Once your child has learned to count to 60, teach them to count to 60 by fives using the same method you used to teach them to count to 60. Teach them the Concept of Time: Once your child has a grasp of the numbers associated with time-telling, they need to learn what time is. Help them understand the difference between morning, noon, afternoon, evening, and night, so they can associate time with the different parts of the day. Make a Toy Clock Together: When your child is ready, make a toy clock out of a paper plate and construction paper. Involve your child in the creation process of the clock to help invest them in the activity. Connect Time to Their Daily Routine:Explain to your child how time relates to activities they perform throughout the day. For example, "It's 5 o'clock, which means it's time to eat dinner." Practice With the Hour Hand: As the easier of the two hands to grasp, start teaching your child how to use the hour hand of the clock so they can relate each number to an hour of the day. Practice With the Minute Hand: As the more difficult of the two hands to grasp, your child may have more trouble understanding how to read the minute hand of the clock. Teach them the difference between the two and don't be afraid to draw ticks on the clock or label each number with the number of minutes it represents until your child understands.